Size: Select 30" x 31" 30" x 33" 32" x 31" 32" x 33" 34" x 31" 34" x 33" 36" x 33" 38" x 31" 38" x 33" 40" x 33" 42" x 33"
With 20 years experience, certain things just come naturally. 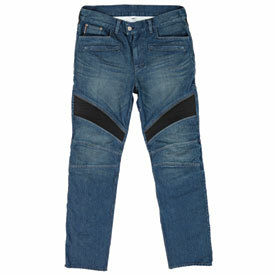 Like designing the ultimate motorcycle jeans loaded with ride-specific features, it’s an inevitable evolution. The Joe Rocket Accelerator Motorcycle Jeans have an added cotton layer and stretch panels at the knee & upper seat areas making them one of the most comfortable motorcycle jeans ever! Kevlar Reinforced in the seat, hip and knee panels. Aramid™ fibers are a class of heat-resistant synthetic fibers used in military applications, for ballistic rated body armor fabric and ballistic composites. Pockets for knee armor (armor not included). Stretch panels at knee & upper seat areas. 7 pockets, including 2 zippered pockets. Reflective stripe on legs and tail bone. Pants are made of good quality for the price. I have other more expensive jeans and these I like best. Bottom of pants doesn't flap in the wind. Stretch panel in thigh and rear of pants for ease of movement on bike. For sport bike riders, I would recommend these for normal, casual riding.